8 1/2 is a 1963 Italian comedy-drama film directed by Federico Fellini. Co-scripted by Fellini, Tullio Pinelli, Ennio Flaiano, and Brunello Rondi, it stars Marcello Mastroianni as Guido Anselmi, a famous Italian film director. Shot in black-and-white by cinematographer Gianni di Venanzo, the film features a soundtrack by Nino Rota with costume and set designs by Piero Gherardi. 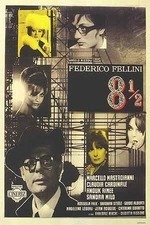 Its title refers to Fellini's eight and a half films as a director. His previous directorial work consisted of six features, two short segments, and a collaboration with another director, Alberto Lattuada, the collaboration accounting for a "half" film. 8 1/2 won two Academy Awards for Best Foreign Language Film and Best Costume Design (black-and-white). Acknowledged as an avant-garde film and a highly influential classic, it was among the top 10 on BFI The Top 50 Greatest Films of All Time, ranked third in a 2002 poll of film directors conducted by the British Film Institute and is also listed on the Vatican's compilation of the 45 best films made before 1995, the 100th anniversary of cinema.